Extension of cable-based telecommunication networks requires high investments in both conurbations and rural areas. Broadband data transmission via radio relay links might help to cross rivers, motorways or nature protection areas at strategic node points, and to make network extension economically feasible. In the current issue of Nature Photonics, researchers present a method for wireless data transmission at a world-record rate of 100 gigabits per second (Gb/s). 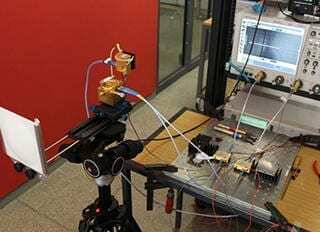 “It is a major advantage of the photonic method that data streams from fiber-optical systems can directly be converted into high-frequency radio signals,” Professor Jürg Leuthold says. He proposed the photonic extension that was realized in this project. The former head of the KIT Institute of Photonics and Quantum Electronics (IPQ) is now affiliated with ETH Zurich. “This advantage makes the integration of radio relay links of high bit rates into optical fiber networks easier and more flexible.“ In contrast to a purely electronic transmitter, no intermediate electronic circuit is needed. “Due to the large bandwidth and the good linearity of the photon mixer, the method is excellently suited for transmission of advanced modulation formats with multiple amplitude and phase states. This will be a necessity in future fiber-optical systems,” Leuthold adds. April 18, 2019 - Is Wireless Killing Our Wired Networks? Electronic DesignWhile wireless grabs the headlines, wired networks continue to reliably do their jobs. But some still foresee the demise of the wired side. April 19, 2019 - Qualcomm said to end chip partnership in China’s Guizhou South China Morning PostMove comes amid rising technology tensions between the US and China and after Qualcomm settled its licensing dispute with Apple. April 18, 2019 - Why Nike Is Moving to Trademark ‘Footware’ Footwear NewsNike is hoping to trademark the term 'footware' to refer to its smart sneakers, such as the Adapt BB, which released early this year.